Earlier this week Netflix released for the first time Canadian ISP data when it came to streaming speeds. 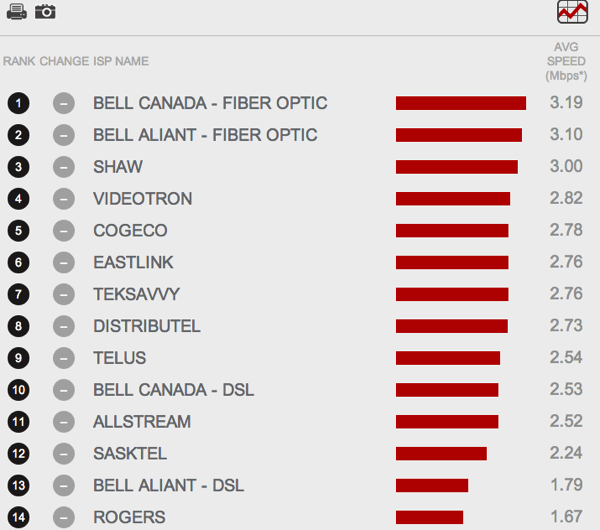 Out of our incumbents, Bell ranked first, followed by Telus in ninth and Rogers at the bottom of the pack ranking 14th. Netflix’s test was done just before we virtually doubled Netflix capacity and we’ll continue to add more capacity as it’s needed. These results only apply to customers’ specific Netflix connection and not overall internet speeds. Independent third party testing continues to show that Rogers offers top internet speeds. Rogers, along with Telus and Bell have been part of the Netflix Open Connect network since early 2013. This network allows ISPs to connect to Netflix’s content delivery network for free to ensure the fastest and most efficient streams. Think of it like this. Let’s say we have a 2-lane highway to the Netflix building. Over time, the traffic gets more congested and more people are on the road, therefore the speed of the traffic slows down. “Throttling” would be removing a lane. “Adding capacity” is building another lane to allow traffic to move at a better, faster rate. Makes sense? While these responses are meant to be reassuring, they raise troubling questions about how Rogers manages its network and whether the slow Netflix speeds could have been used to create a competitive advantage for its own online video services. While the company says that it does not throttle Netflix traffic (ie. deliberately slow it down), its response also suggests that it knew that the service was being slowed by insufficient capacity. Joris Evers from Netflix told us he is aware of Rogers doubling its capacity and says he expects the next tests to show improved speeds by the company.